Phoenix, Ariz., is notorious for impossibly hot temperatures and years-long droughts. While the average person wouldn’t think of the city as a mecca for water management, that’s actually exactly the case. The greater Phoenix metropolitan area has been in a dry period since the mid-1990s, yet its water systems’ resiliency has made it possible to be in the midst of a 20-year or 30-year dry period and not be in a water shortage. This is due largely to wise decisions made decades ago regarding water storage and management — work that is continued today by people like Dave Roberts of the Salt River Project. 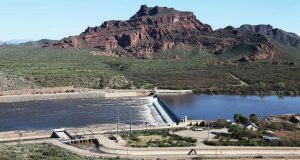 “Considering we live in the desert, residents of the greater Phoenix metropolitan area are very fortunate to have a variety of water resources available, including water from the Salt River Project, the Colorado River from the Central Arizona Project and huge amounts of water stored underground that can be pumped in times of need, not to mention reclaimed water,” Roberts, the associate general manager of SRP, said. Founded in 1903, the SRP is the oldest multipurpose federal reclamation project in United States history and has helped make it possible for millions to live in the desert without having to worry about where their water is coming from. 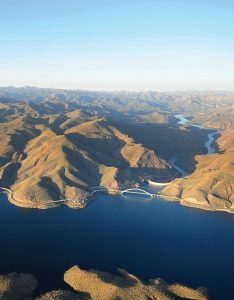 Today, SRP is the largest provider of water and power to the Phoenix metro area, delivering about 800,000 acre-feet annually to agricultural, urban and municipal water users in a 375-square-mile service area while managing a 13,000-square-mile watershed. SRP is comprised of two separate entities: the Salt River Project Agricultural Improvement and Power District, an agency of the state of Arizona that serves as an electrical utility for the greater Phoenix metropolitan area, and the Salt River Valley Water Users’ Association, which serves as the primary water provider for much of central Arizona. “The combined population of the greater Phoenix metro area today is nearly 5 million, and SRP provides about 60 percent of the water to the region through an extensive system of reservoirs, underground storage facilities, wells, canals and irrigation laterals,” Roberts said. Careful planning and efficient systems have also prepped the region for times of potential drought. 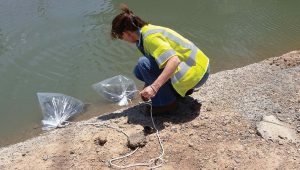 As time and technology continually evolve, SRP employees adapt their practices to best meet the needs of the community and the trends of the industry to ensure Arizona’s water management practices are effective for decades to come. In addition to ensuring a steady supply of day-to-day water for residents to use, the SRP is also responsible for long-term conservation and storage of water for the future. The Granite Reef Underground Project is an example of this forward thinking strategy, and residents likely don’t even know it’s there. 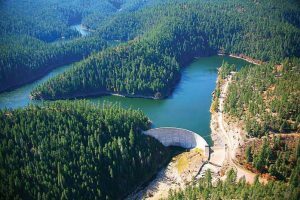 “The Granite Reef Underground Storage Project and the New River-Agua Fria River Underground Storage Project are designed to store water underground for future use,” Roberts said. “Water is stored in the aquifer and withdrawn by well-pumping when needed.” While daily operations run smoothly, SRP leaders are always thinking of the future. 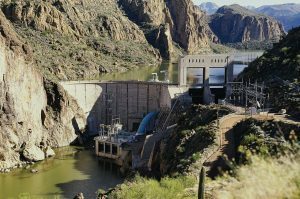 A few projects and partnerships are in the works, including the construction of a second facility to allow the SRP to continue partnership with the Central Arizona Project — a diversion canal that directs water from the Colorado River to parts of central and southern Arizona. Arizona is well known across the country by industry professionals as a thought leader in the field. This is no mistake, according to Roberts. A lot of time, energy and thought has gone into the foundation of SRP and its potential for growth in the future. 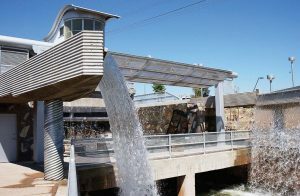 “The Phoenix metropolitan area is a leader in water resiliency. We live in the desert, and we’ve made the critical decisions and long-term investments that continue to pay off today and into the future,” Roberts said.